My favorite holiday growing up was Christmas--as much for the wonderful food everyone brought to our family Christmas gathering as for the gifts. You couldn't always count on Santa to bring what you really wanted, but you could count on your aunts bringing pecan tarts, peanut butter fudge, homemade candies of all kinds, assorted dessert recipes only cooked for special occasions, and never, never, never did they forget to bring the lemon and chocolate meringue pies. There were so many of us that the desserts didn't last long. If you lingered over the ham and turkey, you didn't have much choice left! Spending time with family, singing Christmas carols, Grampa telling stories, the men outside talking about hunting or sports, and the women in the kitchen happily enjoying each other's company--these are all memories I cherish. Lights on the Christmas tree, around the windows and eaves of the house presented such a festive air. Running and jumping with the other children to see who could jump furtherest off the old porch five feet off the ground. These are the memories that mean more to me than the gifts I received under the tree. Frankly, I don't remember many of the gifts. It was usually something like mittens and hat, or houseshoes, or some other item some relative thought I needed more than toys. They were most likely right. But the family times, time spent together sharing each other's lives was really special. It's this kind of memory I wish for my grandchildren. 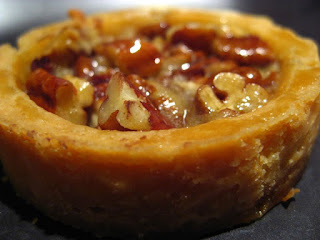 Pecan Tarts are one of my favorite dessert memories! Preheat oven to 350 degrees F. Using hands, mix the crust ingredients well. Divide the dough into 48 balls. Using fingers, press crusts into miniature ungreased muffin pans. In a large bowl, mix the filling ingredients until well mixed. Fill each tart shell until it is almost full. Bake 30 minutes or until crust is golden brown. Cool on a wire rack at least 15 minutes, then remove from muffin pans. Perfect for family get-togethers or office parties. Delicious warm or cold! I love tarts. They are perfect finger food for holiday parties! Tarts are great for parties. I just found a grape jam tart recipe I want to try. Thanks for commenting.